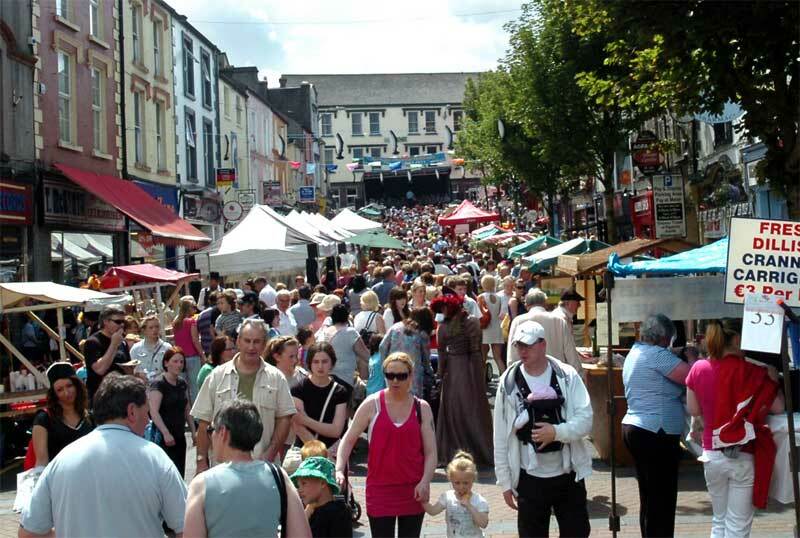 One of the cornerstones of Ballina Salmon Festival, and an original concept, National Heritage Day at Ballina Salmon Festival was developed by the festival committee over 25 years ago and attracts up to 40,000 people to the town every year. On this very special day, feast your senses on the sights, sounds and sensations of a market day 100 years ago, as the past comes to life and the streets are transformed. From the whistling of steam engines, to the smell of the thresher and the sound of traditional Irish songs, this is an evocative trip back in time on a scale you won’t find anywhere else. Watch the finest of Ireland’s craftsmen and women as they demonstrate time-honoured traditional skills. You’ll find basket making, thatching, turf-cutting, cooperage, spinning, glass-blowing and weaving. You can even watch the blacksmith at work. Wander the streets, soak in the atmosphere, listen to the music and learn about many of these ancient crafts, passed down from generation to generation. Watch out for the special Heritage Day edition of local paper, The Western People, especially produced for this day. As always, you can enjoy a plethora of heritage and cultural activities in the Jackie Clarke Collection on Heritage Day. Participate in olde-word heritage games – hula hoops, skipping, hopscotch, ring toss, traditional board games – in the Courtyard all day. Enjoy heritage arts and crafts with Ballina Costume Company and a children’s workshop given by the Jackie Clarke Collection’s Education Department. Marvel at the display of Falconry and Birds of Prey in the Walled Heritage Garden at 2pm – 4pm. Atlantic Rhythm of Ireland’s Got Talent fame will be performing, as will Maria’s Musicians from Ballycastle. You’ll also learn about many of the tourism attractions in North Mayo that showcase our heritage. A fantastic day of craft displays is also in store for everyone attending Heritage Day; the old to reminisce on days gone by and the young to marvel at the skill and dexterity of the rush-crafter, the wood turners and the rope makers. The almost forgotten sound of the blacksmith’s hammer and anvil and the smell of the furnace will fill the air while the soft, grinding of the thresher will transport you to by-gone days. The glass-blower, an uncommon sight today, will captivate all who pass by as the tin-smith exhibits his skills near-by. Wander the streets, soak in the atmosphere, listen to the music and learn about many of these ancient crafts, passed down from generation to generation. And to pay homage to our celtic heritage, Gnó Mhaigh Eo will be in attendance to encourage the cúpla focal and local sean-nós dancers will enthral with their smooth, rhythmic movement to the sounds of traditional music. As well as on-street entertainment throughout the day, keep an eye open for some great acts performing on the main stage at the Post Office. Up-and-coming Foxford band The Kerbs will be making an appearance, as will Mayo Youth Orchestra, who are going from strength to strength, and watch out for some great other musical performances throughout the day. Last year, the performance of the Garda Band made international headlines when they were joined on stage by Ballina native Garda Alan McGinty, who delivered a spine-tingling rendition of “My Way”, much to the delight of the huge crowd. We are delighted to welcome the Garda Band back to the main stage this year from 2-4pm, where another couple of surprises await! National Heritage Day is not just a day to come along and witness – it’s an immersive experience, Everyone is encouraged to dress up and participate in this exhibition of living history. Hire a costume from Ballina Costume Company located in the old Parochial Hall on Bury Street – call +353 (0)96 72154, email costumecompany@eircom.net – or make your own! National Heritage Day is kindly sponsored by McFadden Funfairs and Midwest Radio.